& FORMING "AL & THE G-MEN"
I had been out of music now for almost a decade. But I saw a guy one day at the building where I worked, and he was carrying a guitar on his back. I asked him if he played, he modestly said, “A bit”. But we kept running into each other there and started discussing music. Glen and I bought a basic video camera and we started filming the shows and putting, with the musicians’ permission, video’s up on Youtube. Luckily, my new friend, I nicknamed him,“G-MAN”also knew computers, because I was still, as I say, pretty well a Luddite. But he was very patient and gradually was teaching me more and more about it. I’d had a Mac before, but I had to learn how to use a PC now. And just a week later there, we saw another singer who I thought was special, a country singer, AMANDA BON. With her was this really good guitar player. My friend said that was DANNY ARTUSO. I hadn’t seen Danny in years. He had been the talented young guitar player with Diane Gentes, I’d first seen in the 80’s. I approached Amanda after, and said she reminded me of Emmylou Harris and Nanci Griffith in her songwriting. She said they were two of her favorites too. So I had discovered within a week in one place, two or three artists I could perhaps help. Now, as I say, I had thought music was pretty well behind me. But these people, especially, I thought, had real potential. Both Natalia and Tony, and Amanda soon had some of the most respected Ottawa players as part of their bands. They even shared the same bass and cello player, Ken Kanwisher, who also played with Ian Tamblyn. By late 2011, they had each recorded and released their first CD’s. Natalia and Tony and their band “NATALIA AND MONTUNO” released “MOVING NORTH” and Amanda Bon released her “JUNIPER WEEKENDS”. They both started getting more shows around town and I’d attend and video them, which they said helped them see themselves and improve their performances. I had gotten to know Harvey Glatt more. As I said, he was a legend in Ottawa, and as well having had brought in many big name acts to Ottawa like Harry Belafonte, Jimi Hendrix, Johnny Cash,etc., he had been part owner of the legendary Hibou Coffeehouse in the 60’. He may well have introduced Graham Nash of Crosby, Stills and Nash, to Joni Mitchell when they were both in Ottawa at the same time. He had also managed several successful Ottawa bands and musicians like”THE ESQUIRES” and “ 3’s A CROWD” with Richard Patterson, whom I had interviewed. I had also interviewed another pivotal musician/songwriter Les Emmerson of “The Staccato’s” and “The Five Man Electrical Band” for my original book on Ottawa’s music. Harvey also owned part of Bruce Cockburn’s label, True North, that Lynn Miles had been on, and had managed Ian Tamblyn too. So he knew talent, when he heard it. Harvey could still often be seen in the clubs searching out potential talent, as he had when he would go see my friend and now landlord’s band “LISTER”. He especially liked Amanda and would go to most of her shows. I also told him about Natalia and arranged a meeting with her and Tony. What I especially liked about Harvey was that he always said what he felt, unlike some in the music business. He thought Natalia was talented too, but he thought she might do better in a bigger place like Montreal or Toronto, where there might be more of a Latin audience. I disagreed with him somewhat, because I saw her more in the line of an ADELLE or AMY WINEHOUSE, whom were currently very popular , whom Natalia liked too, but she had an added Latin feel. I’d never thought I would again get back into music but maybe at the most, work on my long delayed book about my life and music. I ran into Ian Tamblyn for the first time in years, and he gave a free copy of his latest Cd (his 30th!) and told him I might be getting back into music again. He was very supportive and said “It’s your passion”. I ran into Lynn Miles again for the first time in a while at Irene’s and she was also very nice. I told her I had an old photo of her from Barrymore’s in the 90’s I wanted her to have; I had kept files on several musicians. She replied in her characteristic humour ,”Should I?” Once when I saw her at The Blacksheep Inn, a guy next to me yelled out ”Don’t you know any happy songs?” She was known for her sad, relationship songs. She replied, ”What?” I said,“That is a happy song” and she told the guy “Bite Me!” I rushed home to get the photo and asked her when she was performing and she said that next week in a church. My friend,”G-MAN” and I went and she blew us away; a combination of her hurting songs and her amazing humour. I always thought she could have been a standup comedian. Later I was to run into her on the street and she gave me her latest acoustic Cd free. And I told her I was attempting to write songs. Ian and her hadn’t changed since I’d first known them; still encouraging others. I was now even trying to write songs; something again, I never thought I’d do. After seeing Amanda dance (she was also a dancer, having studied flamenco), I was inspired to attempt my first song. I saw a whole different side of her and tried to capture it in the words in my song, “Like a Dancing Star”. I would usually come up with the idea for a song (it sometimes came at night in a dream state) and then get up and write down the words. Later my friend,”G-Man”, would ‘doddle’ on his guitar until a melody would come. Often, I just knew when we hit it right, what I’d wanted to capture in the song. I guess just being around pop music all those years helped. Sometimes I would sing on some and add percussion, and sometimes he would add on other instruments at his place: harmonica, slide guitar, bass, etc. “G-Man” and I just seemed to complement each other, both musically and personality-wise. I was more the rocker and he the folkie. I was always trying to push him a little, to try something different with each song. And often, I think he was surprised what we came up with and liked it. He was more shy about being up front, so I named him “G-Man”. But it was the combination, I think, that worked. We called ourselves “AL and THE G-MEN”. Again I didn’t know I could; I had always been around music and had so admired people who could. I thought it would be so hard to write songs, but once they started, they just seemed to pour out. “G-Man” and I would occasionally go to ‘open stage’ nights like when he did “BALLAD OF HARVEY GLATT”, a tribute to Harvey Glatt, at the Spirit of Rasputin’s. And other musicians came up and congratulated us; so maybe we were doing something right. I said, at that point, I’d only been writing songs for a few months and a musician said, “No, you’ve been doing them for 30 years!” We had just started doing it for fun and would record them, usually in my kitchen, and make our homemade Cd’s on the computer. Soon we had written and recorded, very basically, over 50 songs in one year! So it was surprising when we got several played on Carleton University’s CKCU-FM. My Beatles friend and co-founder with John Whelan of The Ottawa Beatles Site, Tony Copple, had a regular show and he thought some were good enough to play on the air. In October, 2012, Natalia and I co-wrote a song based on a Lynn Miles line for a CBC contest for a “25 Years “Tribute Show at the Ottawa Literary Festival. And believe it or not, we ended up in the top five finals and got CBC airplay too. We won free tickets for the event, which was held at the church on Elgin St. I hadn’t been in since Sarah and I had gotten married there in back in ’86. The girl, ERIN SAOIRSE ADAIR, who won and got to perform with Lynn, liked our song, and kindly contacted us. Later I met Erin and I liked her too. She was in an all female, politically-oriented, folk group ”THE THREE LITTLE BIRDS” who were developing quite a following. 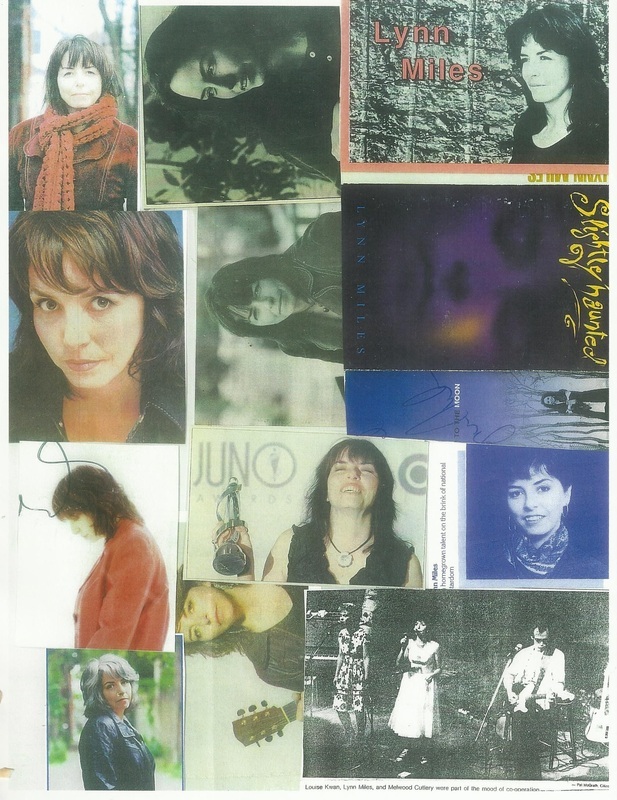 And before I knew it, I was putting on my first and biggest high profile show, the” 3 SONGBIRDS” CONCERT", I had organized since my two Ottawa Beatles Conventions in’95 and ‘96. 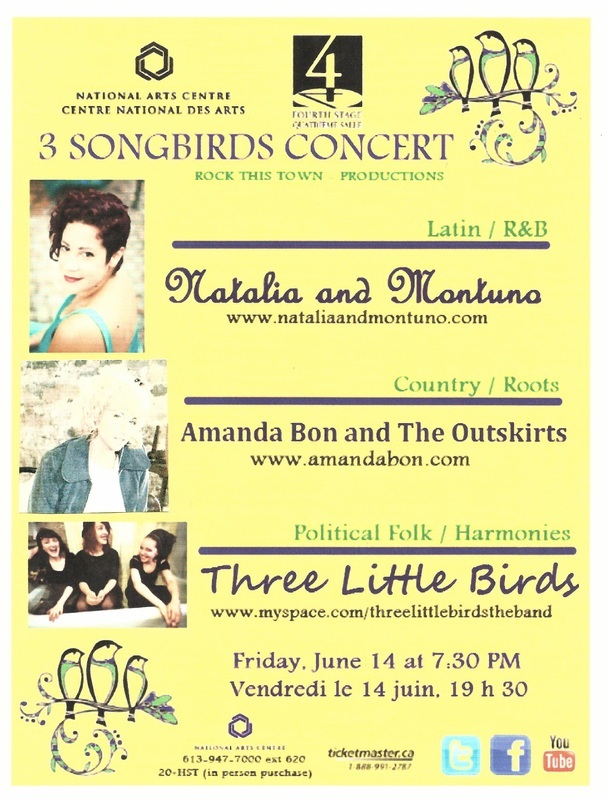 Natalia and Amanda and “THE THREE LITTLE BIRDS” all agreed to play on one bill for me at the prestigious NATIONAL ARTS CENTRE. It was on June 14, 2013. As I say, I never planned to do any of these things and still wasn’t sure where this might all lead, but it was fun and creative to be doing it again. And I couldn’t have done any of it (including this book) without my new friend, “G-MAN”. Also the City of Ottawa Archives contacted me about being interviewed and I donated several of my artifacts for their exhibit on the History of Ottawa Music in 2013 and 2014. So I guess I’m back into music again! For as Ottawa’s Cooper Bros. sang in their 70’s hit, “The Dream Never Dies”. To hear REGGAE version by The Gee-Men and ORCHESTRATED POP versions by THE GENTS of "WE DIDN'T KNOW", produced by Bryan Anthony go to www.soundclick.com, and type song name in search. BELOW: PARKER ESTABROOKS (lap guitar and vocals) and my old friend, SHAWN ROSSEAU ("ECANO")(Lead Guitar), & Friends jamming, Irene's,SAT.Afternoon "Open Stage", where in 2010; I also first met Amanda Bon and Natalia and Montuno. “NATALIA AND MONTUNO”: Natalia Cabrera, originally from Argentina, writes and sings with a velvet voice, a mixture of jazzy/ R&B original songs but with a Latin twist. And she and her band ”MONTUNO”( Tony Cook, Kurt Walther, Ken Kanwisher) get people up dancing. They released their CD “MOVING NORTH” in late 2011. She performed at the 2013 Ottawa Jazz Fest. “AMANDA BON and THE OUTSKIRTS”: Amanda writes well-crafted country-roots songs that capture everyday lives. And with her excellent band (Danny Artuso, Ken Kanwisher, Gilles LeClerc) they’ve gained a loyal following and performed at 2012 Junos. She released her 1st CD “ JUNIPER WEEKENDS” in 2011 and her 2nd. "Down The Road" in June, 2013. “THREE LITTLE BIRDS” ﻿(﻿Amelia Leclair, Erin Saoirse Adair, Angela Schieihauf) are carrying on that great folk tradition of acoustic melodies and songs on social and political issues. They have 3-part harmonies and world rhythms. They released their debut CD to acclaim in 2011 and were nominated for a Canadian Folk Music Award in 2012. 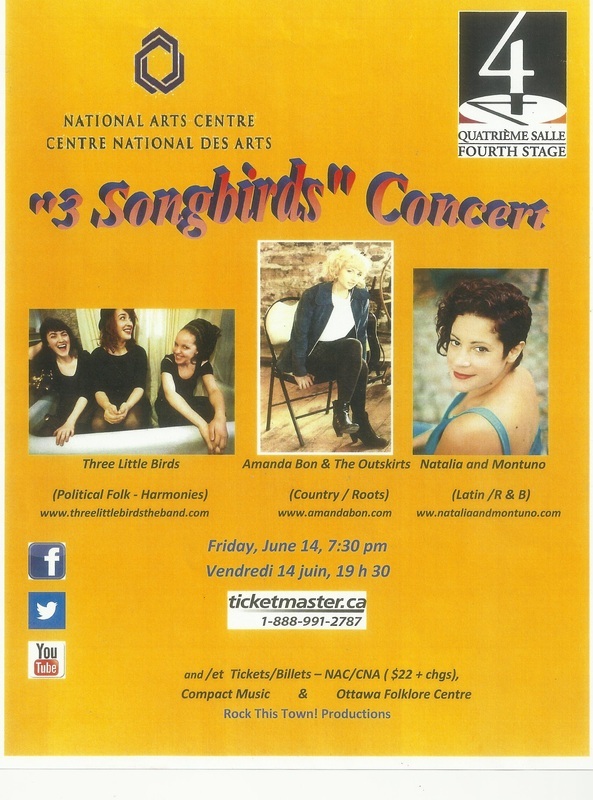 LISTEN BELOW TO AUDIO EXCERPTS FROM "3 SONGBIRDS" CONCERT: "NATALIA AND MONTUNO"; "AMANDA BON AND THE OUTSKIRTS"
ABOVE: 'AMANDA BON & THE OUTSKIRTS' & BELOW: 'NATALIA AND MONTUNO' WHO LATER PLAYED OUR " 3 SONGBIRDS " CONCERT NAC, JUNE 2013, ABOVE. Dues paid on the road, Austin, Nashville, L.A.
You finally get a JUNO, a JUNO! Yes, it is the desperation of a "late night telephone call"